The Township has guidelines for your driveway. The Township has guidelines for your mailbox. The Township has guidelines for trees (prohibited and recommended). Downers Grove Township Brush Pickup dates. Please remember that while these are our target dates, delays due to equipment failure, weather conditions, etc.) are always a possibility. Remember this is an optional service. The Township provides it’s residents with wood chips/mulch for free. The Township provides free Christmas tree pickup. The first two (2) weeks of the year. The Township requires a signed covenant agreement from homeowners for brick drives, invisible fences and sprinklers within the public ROW. The Township and DuPage County require a permit for removal and replacement of existing driveways. The Township has a “No Parking During 1 inch Snowfall” Ordinance. 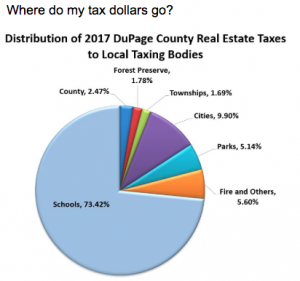 The Township is a member of DuPage County’s – Public Works Mutual Aid Program (PWMA). The highway department along with the other townships in the county are part of one of the nation’s first Public Works Mutual Aid programs. Pooling resources to better serve our residents in the event of a disaster. The township is home to a wide variety of wildlife, strategies for dealing with wildlife.